#8: Time. C Press (1965). An Installment in Jed Birmingham’s series of the The Top 23 Most Interesting Burroughs Collectibles. Book collectors are consumed with envy. Covet not thy neighbor’s books. Try as we might, even the most saintly of collectors amongst us cannot help themselves. For true bibliophiles, the temptations of print are legion. These objects often appear in the bibliographies of authors one does not primarily focus on. For example, I revealed my personal sins in a piece on Charles Bukowski and Black Sparrow Press. To some extent that essay is flavored by sour grapes. Quite simply, I am jealous of Bukowski collectors. They strike me as a vibrant, close-knit community and, particularly with Buk’s bibliography in the 1960s, they have tons of fun and interesting items to collect. Books and magazines, many of them prime examples of the Mimeo Revolution at its best, which I want all for myself. In addition, I should admit that this rabid, enthusiastic Bukowski community is probably a by-product of the very Black Sparrow model I so despise. The horror! The horror! I happen to think that Martin’s model is more hype than hip, but there is no denying the energy of the Bukowski collectible market. I think the format here illustrated with examples enclosed is the best for the book we have under preparation. That is three columns of text newspaper format of a small town newspaper or of a number of such papers fitting into each other. I have a number of titles that could be used The Nova Police Gazette The Bad News The Silent Times The Present Times The Past Times The Last News The Last Post etcetera. For our purposes perhaps we should simply follow through with the three columns and not change titles. Now we could for example file The Silent Sunday Post with drawing or have all the drawings on the other side of the text which would be a simpler and more inexpensive format. It occurs to me that we might sell these newspaper issues like the enclosed to the rare book trade properly printed and illustrated. Perhaps J. Roman [a rare book dealer] would do the publishing. However, things are looking up. The Esquire article will be out in September, I have enough material now for my Time format magazine. I am sure it will sell. The success of My Magazine has been amazing. There is a gallery open here. Following this mark up I have been cutting out bits of text old letters etcetera pasting photos and blocks of text in copies of my books (Nova Express now out) a photo for every page of diary always using when possible original material rather than retyped matter and so finding a use for all the old texts and photos. I hope the two pages enclosed will give you an idea. The scrapbooks of which I now have three and the copies of my books with photos and text inserted should be saleable for good prices to rare book collectors and dealers. And I believed the cut-up was Burroughs’ true religion and his quest to rub out the word was pure. 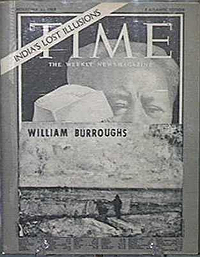 Burroughs as avant-garde saint. But no, the Burroughs I love most, the most experimental Burroughs, the Burroughs of the cut-up was on one level merely Burroughs on the make. With the scrapbooks, the three-column formats, and the grids, he is in part following up on the marks. Burroughs realized the rare book world was a con, a carny underworld of dealers, barkers, addicts, marks, and johns. Like any system run by the Algebra of Need, it is corrupt. With money in the offing, there are naturally fakes and forgeries. RealityStudio has come across and exposed a few of those. And then there is a whole industry of manufactured collectibles; holy relics fashioned for the foolishly devout, like, oh, how I hate to say it, the C Press Time, published by Ted Berrigan and edited by Ron Padgett. Time could have been a Black Sparrow publication, as it follows Martin’s model. 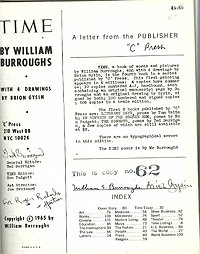 First, there is a trade edition of 886 copies, with a smaller edition of 100 numbered copies signed by Burroughs and Gysin. Then an additional 10 lettered copies hardbound in special floral cloth with a manuscript page by Burroughs and an original drawing by Gysin. The remaining four copies were hors commerce. Supposedly, some copies were issued in a case. The trade edition sold for $1.50, the signed paper edition was $10. The hardcover edition was $25. With Time, Burroughs and Ted Berrigan demonstrated to Black Sparrow how the game was played. A copy of one of the ten lettered copies is currently available on Abebooks for over $18,000. My copy, number 62, was additionally inscribed by Berrigan to book dealer Roger Richards. This is an interesting association especially in light of the book-collecting con, because it highlights the relationship between hipster writers, like Burroughs, Berrigan and Corso, and the rare book trade. Berrigan was always looking to make a buck. After all, speed and Pepsi are not free. On one level, C Press was like an ATM machine. Let’s take the C Press Sonnets. Of course this is a major work of post-WWII poetry, and an important example of self-publishing in the spirit of Walt Whitman and Leaves of Grass, but it was also a cash cow for Berrigan. Almost immediately The Sonnets (as did issues of Berrigan’s C: A Journal of Poetry) went out of print in its tiny initial printing of 300 numbered copies. If you notice on Abebooks, there are several copies for sale but all of them are unnumbered. I cannot remember the last numbered copy I actually came into contact with. Clearly, Berrigan had an arrangement with book dealers, like Roger Richards or Bob Wilson of Phoenix Bookshop, to run off a copy if there was a collector out there feeling the jones. It was a form of print on demand. This must have been common practice for starving poets and writers. For example, it is common knowledge that Corso generated holograph poem manuscripts for Roger Richards whenever Corso needed a quick buck. The Mimeo Revolution developed because corporate publishers would not touch New American Writing with a ten-foot pole. As a result, writers had to self-publish. The audience was in many cases other writers and artists. As such the publications circulated within that creative community. Often for free. Semina and Floating Bear are two good examples of such distribution. But Time shows the presence of another important community: book collectors. Collecting the Mimeo Revolution did not begin with the Secret Location exhibition in 1996 and the accompanying book/checklist published by Granary Books. 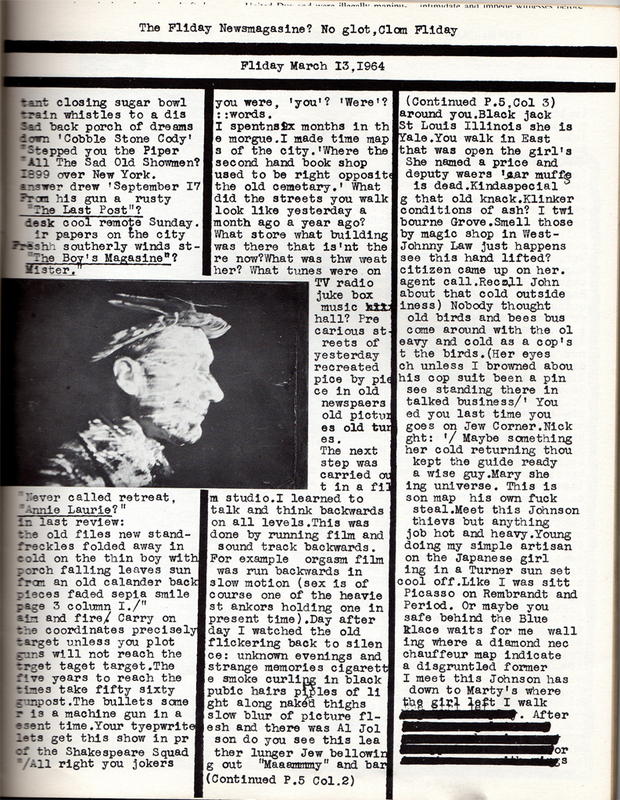 No, as with rock posters and handbills, mimeographed little mags were instantly collectible. Ed Sanders’s Peace Eye Books and his catalogues for the store highlight this fact. These catalogues are crucial in documenting the collecting culture surrounding the underground. They show what was in demand and what was considered rare. And they do it with humor by wonderfully satirizing the world of book collecting. Sanders was not alone. Gerard Malanga, while he was an assistant at Warhol’s Factory, brokered archive deals with libraries and institutions. Little mag editors commonly sold their archives to institutions to finance further issues or a much needed sabbatical for a creative project. 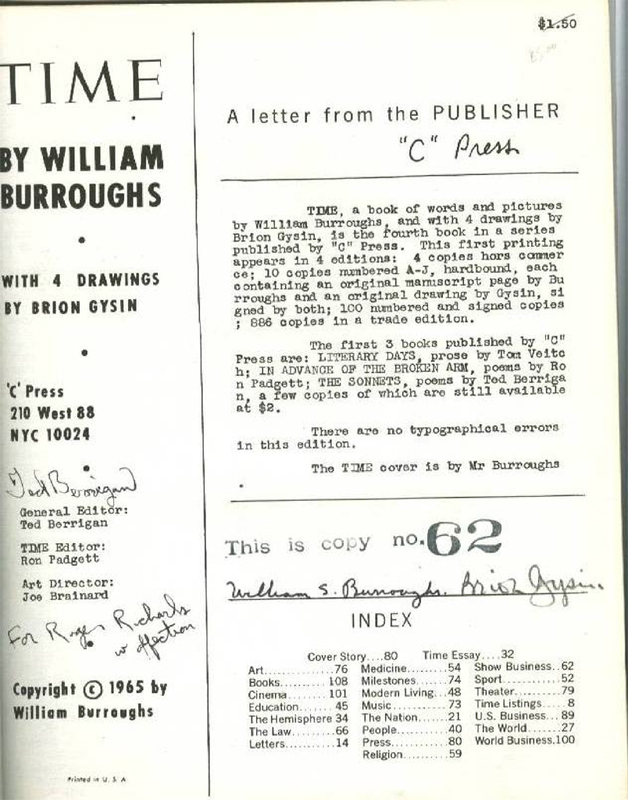 The C Press Time would be a top ten Burroughs collectible merely because it lays bare some open secrets about the Mimeo Revolution, but it also helps that it is the finest example of a Burroughs scrapbook ever published. 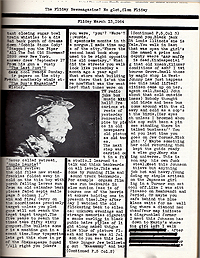 Time, APO-33, and little magazines, like My Own Mag, have captured the attention of collectors, of Burroughs and otherwise, for decades. It is time scholars and academics got on board. Critical attention on these works is lacking. Yet such a study would have to take into account that Burroughs’ cut-ups were as much as a manipulation of the rare book and art markets as a purely intellectual experimentation with text and image. The cut-up must be considered not just in terms of the three-column format but also as a form of three-card monte. Personally, I do not care if I am being played. 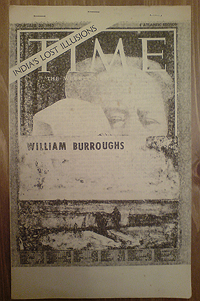 My unabashed love of Time as a literary work and as an art object proves more than any other Burroughs publication that I am a mark for his con on all levels. Written by Jed Birmingham and published by RealityStudio on 21 February 2016.